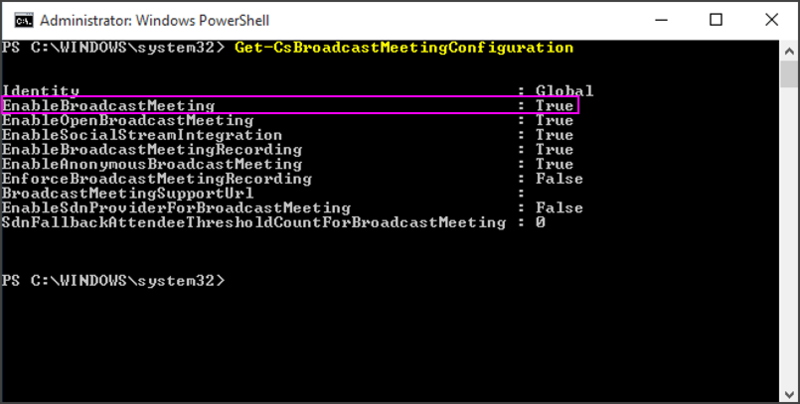 Before the people in your organization can use Skype Meeting Broadcast, you need to enable it. To do this, you need to know how to use Windows PowerShell. If you don't know Windows PowerShell, consider hiring a Microsoft partner to do this step for you. Sign in with your Office 365 global admin account at https://portal.office.com/adminportal/home. In the Office 365 Admin center go to Admin centers > Skype for Business. In the Skype for Business admin center, go to Online meetings > Broadcast meetings, and then select Enable Skype Meeting Broadcast. Verify that you are running version 3.0 or higher of Windows PowerShell. To verify that you are running version 3.0 or higher: Start Menu > Windows PowerShell. Check the version by typing Get-Host in the Windows PowerShell window. If you don't have version 3.0 or higher, you need to download and install updates to Windows PowerShell. See Windows Management Framework 4.0 to download and update Windows PowerShell to version 4.0. Restart your computer when you are prompted. You will also need to install the Windows PowerShell module for Skype for Business Online that enables you to create a remote Windows PowerShell session that connects to Skype for Business Online. This module, which is supported only on 64-bit computers, can be downloaded from the Microsoft Download Center at Windows PowerShell Module for Skype for Business Online. Restart your computer if you are prompted. From the Start Menu, choose Windows PowerShell. Verify that the parameter EnableBroadcastMeeting is set to False. 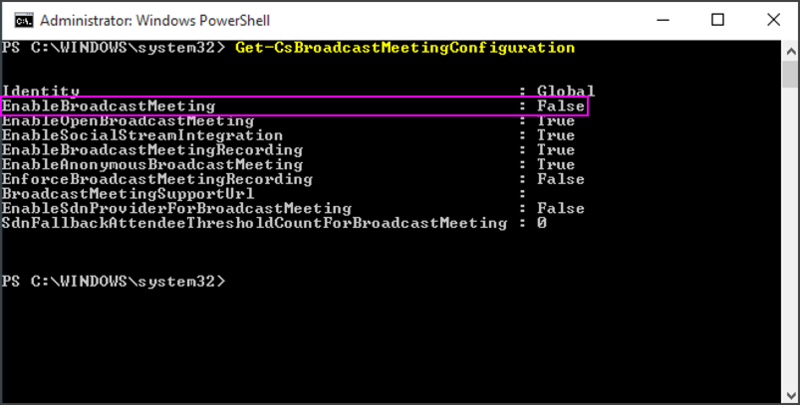 You can confirm that the setting is enabled by running Get-CsBroadcastMeetingConfiguration again. After you make the change, it may take up to an hour to take effect in the Skype Meeting Broadcast portal. Your users can now hold broadcast meetings with other users in your business. To get them started, point them to What is a Skype Meeting Broadcast? If you have a firewall, and you want to hold broadcasts with people outside of your business (who are not a federated business), you need to configure your network using these instructions: Set up your network for Skype Meeting Broadcast. If you aren't experienced with configuring your firewall, consider hiring a Microsoft partner to do this step for you. To skip this step and instead add another business to your federation, see Allow users to contact external Skype for Business users.